It’s good for your spirit. Ann found this photograph on CatalystYogi. 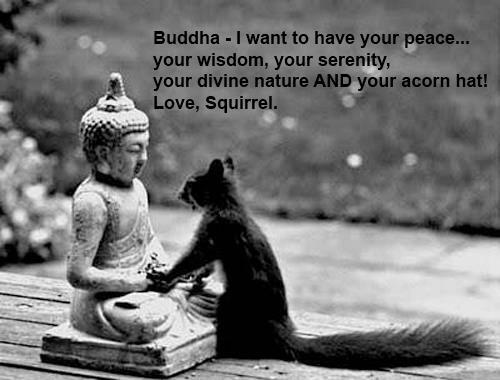 Anne, this puts my life in a nutshell – pardon my pun, Squirrel. I have always preferred animals to people. We have always quite simply been in sync. 18,000 years ago when I smoked a little dope … and I do mean a little as a joint would last me a week and I do mean long ago as a lid cost me $7. Well, the first thing that I always wanted to do after a few tokes was “get little.” Littler than Mr Squirrel here … so that I could be on a par with all creatures, but also so that I could go anywhere. I thought that it might be the key to a time machine. I love this peace/piece. I love and appreciate it. Thank you.